A few months ago, Instagram announced that they will be introducing several features to make the social media platform more accessible to different categories of users. To start with, they introduced one of such features known as the Alt text that allows you to add a description to your images. As noted, Instagram has over 285 million impaired users in need of easy-to-use alternatives for accessing the resources on the platform. They are therefore concerned with helping these minority of users to enjoy their services just like every other user. While it is possible for screen readers to interpret posts with text contents, interpreting and relating images and videos is a great task. Since the introduction of this feature, a few persons have been able to adjust and add the needed alt texts to their images. Well, some other persons don’t know how to go about it. 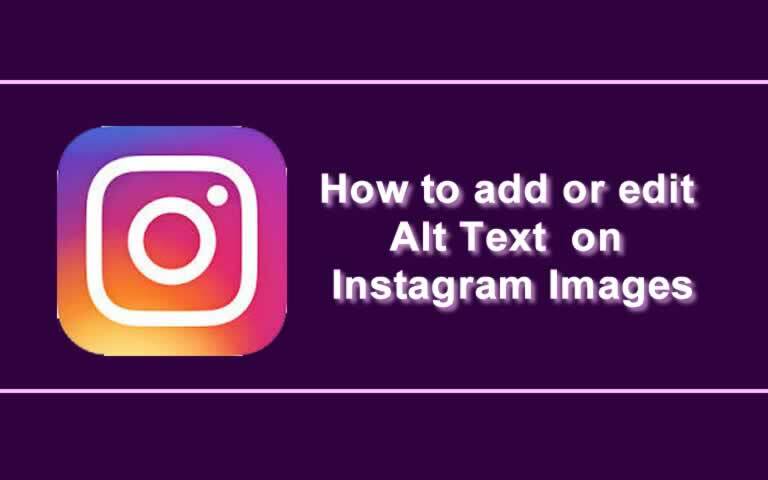 Therefore, in this post, I will show you how to add an Alternative text to Instagram photos to help improve accessibility and users experience. Before I take you through the steps, let’s get acquainted with what the Alt text is all about and the basis for its introduction into web design and other Internet-based products. What is an Alternative Text? Alternative Text, most known as alt text, isn’t a new feature on the web, but it has just been introduced by Instagram. It is a feature that adds further description to an image mostly used in web design. This feature plays three important roles on web pages. First, it enables users of screen readers to listen to and understand what a particular image means. Screen readers are used by visually impaired individuals who prefer listening to the texts as they are being read. So, alt text improves the description of images accessed by these readers. Similarly, alt text provides textual information on a webpage in the event when the normal image fails to load. Normally, when an alt text is not included to an image, a rather distorted or awry icon will be displayed by browsers. By using an alt text, the description contained in the text is displayed to add more meaning to the image. Finally, in digital marketing, alt text improves the SEO of images on a webpage and is considered a factor in determining the relevance of that page for search ranking. This role is most understood and considered by bloggers and e-commerce websites in delivering their contents, services and products. 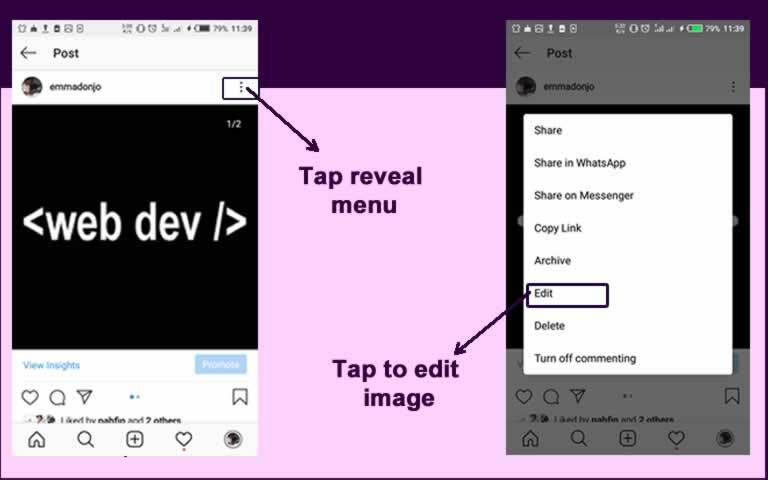 However, this feature is being introduced in Instagram to improve accessibility by visually impaired users making the platform more user-friendly. As earlier stated, alt text can be added during upload or after upload. Here, we will get to know how this text can be added to a photo(s) you’re uploading to your platform using the app. Launch the Instagram app and tap the photo upload button – this is usually an icon having a plus sign embedded in a curved border square - access photos on your phone. Select as many photos as you want to upload and tap Upload. You must have created an Instagram account already. Otherwise, download the app from your favourite store and create an account by providing the requested details. 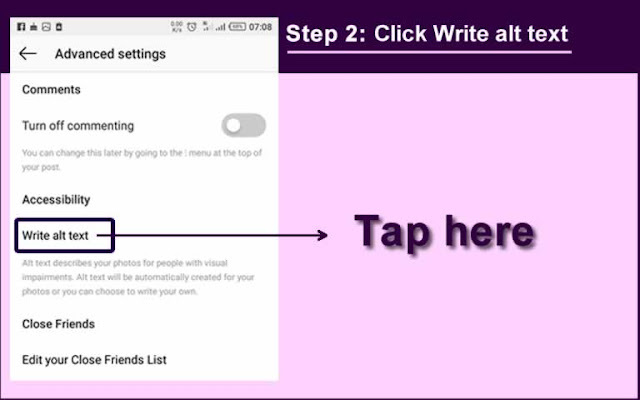 Tap Next at the top right corner of the screen and carry out your preferred editing on the photo you have selected. Once satisfied with the editing and filtering, tap Next to continue. Next, tap Write alt text. 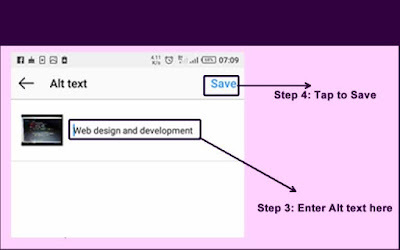 Enter your preferred alt text into the input box and once done or satisfied, tap Save at the top right corner. You can carry out other default settings such as sharing on other social media platforms. Then upload your photos with joy. This is relevant when you have uploaded a photo without providing the description text. Say, you were in a rush and uploading a lot of pictures, and as such do not have enough time to add the alt text. Similarly, past photos uploaded to the platform prior to the introduction of this feature might require you adding the text. The ability to add this text later grants you the convenience to come back and add whatever description you want. Launch the app and access your uploaded photos by tapping the user icon at the bottom right of the screen. You can scroll up and down to view the photo you want to add this description. Once you have seen the photo, tap on the photo. Next, tap the menu button at the top right denoted by three dots. At the base of the image, tap Edit Alt Text to access the window where you can edit or add alt texts to the image. 1. Keep the length as concise as possible: this does not mean your text cannot be long, but keep this length optimum. Avoid developing a paragraph just to describe an image. A short sentence will be ideal to use. 2. Provide a relevant description: the aim of this text is to add meaning to an image that screen readers can access. For this reason, endeavour to enter a description that interprets the contents of the image. This will aid visually impaired users to understand the information your photo is relaying to viewers. Do not add meaning the image uploaded. Screens readers might not be able to interpret due to their difficult nature. Generally, avoid expressions that cannot be read or interpreted by screen readers. Instagram, just like other social media platforms and websites, is bent on improving how people of all categories access the services and products they offer. With the need to make the internet more user-friendly and accessible, different features have been and are being added to the existing services and features of these platforms. 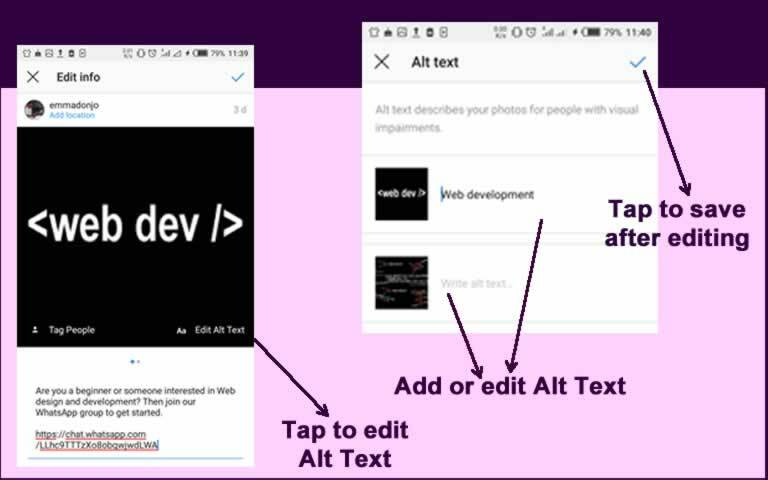 Alternative Texts is one of such features aimed at improving accessibility and most beneficial to users with visual impairment who rely on screen readers to digest the contents on social media platforms such as Instagram. 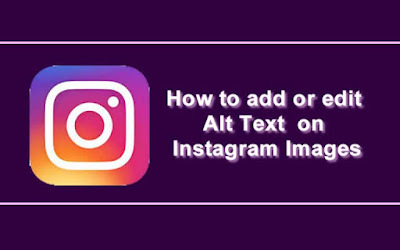 Whilst it is not mandatory to add Alt texts to your images, it is, however, advisable to help others understand and interact with the images you publish by adding relevant and clear texts to your images.